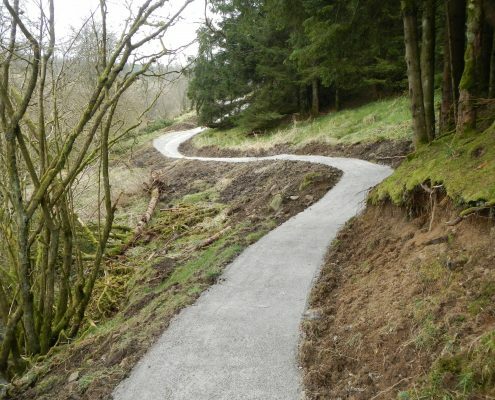 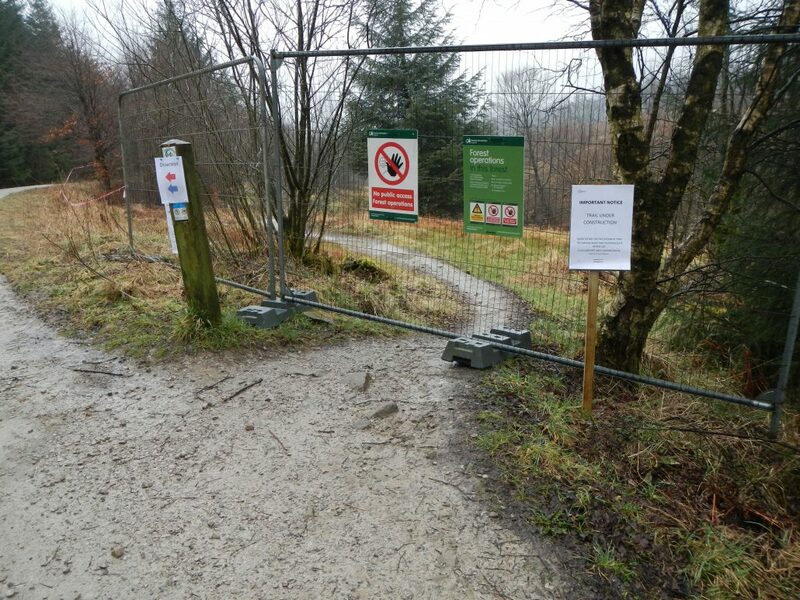 As part of the Forestry Commission England MTB Framework agreement with Conservefor, mountain bike trail maintenance contractor, were appointed to complete an upgrade to the final section of the blue MTB trail at Stephen Park in Gisburn Forest. 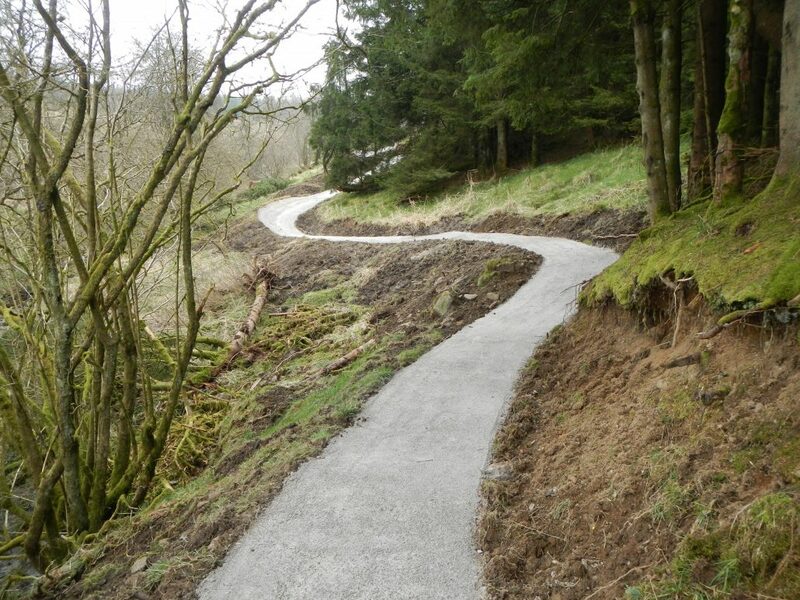 This upgrade was to include a complete resurfacing, improved drainage and improvements to berms and technical trail features to extend the trails lifetime well into the future. 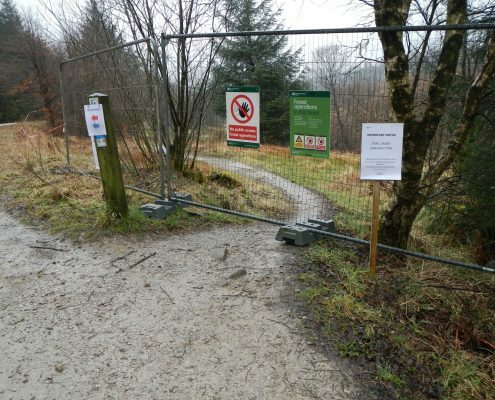 The section of trail itself was heavily eroded by water and high levels of traffic which caused the final section of the trail to become tricky and unenjoyable to ride. 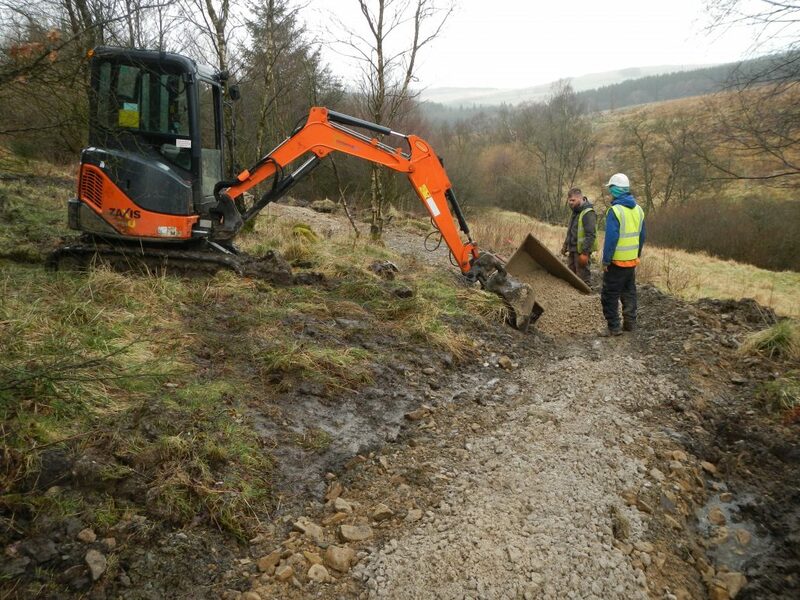 We deployed our dedicated 3 man trail building team with our bespoke three and five tonne 360 excavators fitted with tilt rotate attachments along with our 3 tonne tracked dumper to assess the damage and come up with an effective plan to bring the trail back into use. 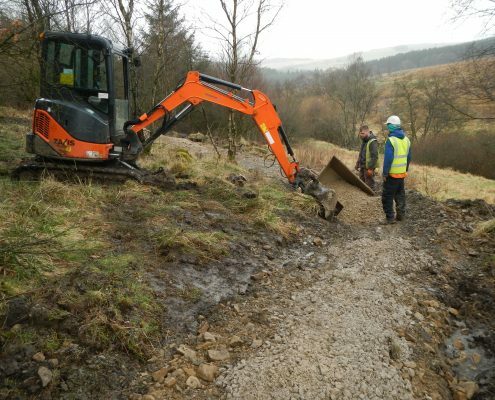 Our first task was to sweep the whole section with our excavator to remove any encroaching vegetation from the original trail surface, clear the original drainage ditches and add further ditches and piping where required. 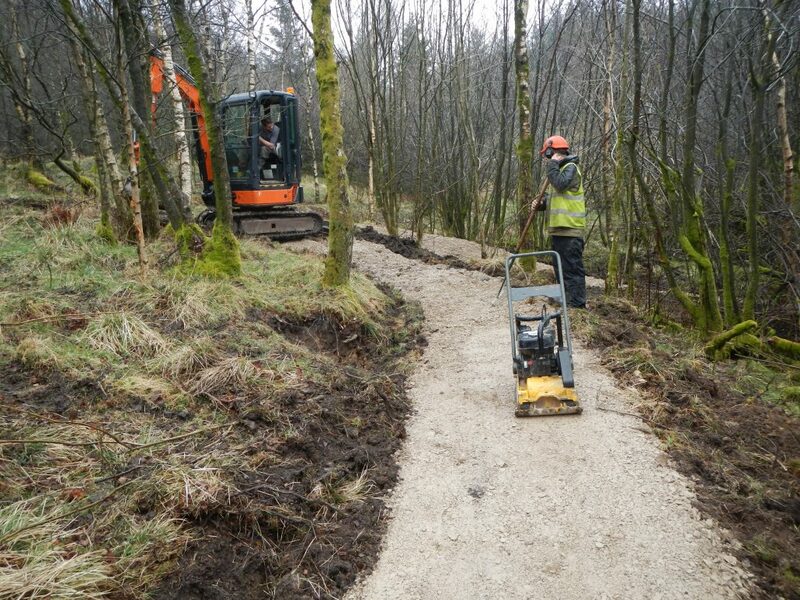 Our highly experienced plant operators then set to work levelling the original trail and building up existing berms and trail features as well as adding further, more durable features to add to the enjoyment of the overall ride. Once the new trail had been reshaped we added a further topping of aggregate to help consolidate the new trail and used our excavator with tilt attachment to work on the landscaping around the trail to improve the drainage and support of the trail whilst at all times helping the trail to blend into and have minimum impact on its surrounding environment. 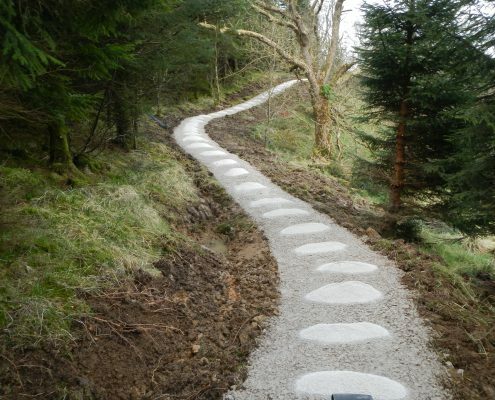 Conservefor a leading mountain bike trail maintenance contractor have a dedicated team of trail builders who, as well as being passionate riders, also have a wealth of plant operating knowledge as well as years of experience in undertaking environmental conservation works. 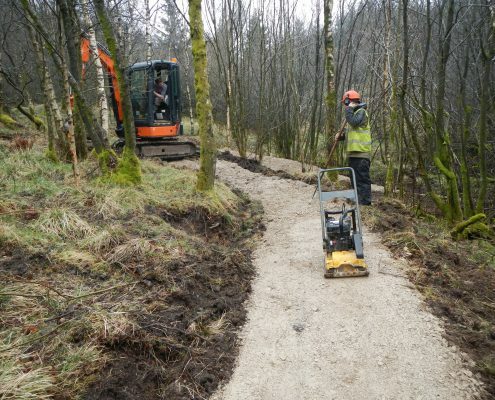 All this combined provides a considerate and low impact approach to trail building, whilst delivering a high quality and long lasting trail which is above all thoroughly enjoyable to ride.